I bought this for myself. True, the title suggests it's for children, but I totally bought it for ME, not the girls. I found it at the Vintage Stock store on South Main Street in Joplin. My little brother was born when I was 10 1/2. My mother had a cassette tape of lullabies she would play. Side One was with (beautiful) vocals, Side Two was instrumental versions of the same songs. Perhaps the loveliest song was a version of Eugene Field's poem "Wynken, Blynken and Nod," one of my favorites. I remember that the music was credited to folksinger Buffy Sainte-Marie. When I would read the poem to the girls, I always sang it to the melody on the tape. Years later, I finally saw a clip of Buffy Sainte-Marie singing her version of "Wynken, Blynken and Nod." It's pretty, but it wasn't the melody on the tape. Then as I was playing around on the internet, I found a clip of The Simon Sisters singing their version of the poem. This is the melody I knew. 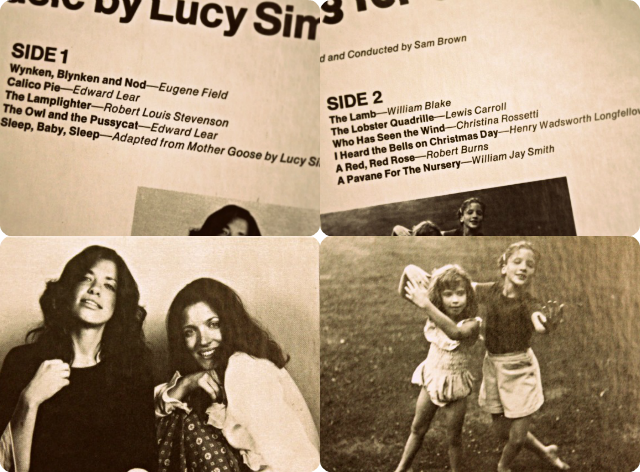 The music was written by Lucy Simon, older sister of the more famous Carly. The Simon Sisters had a short recording career. This album was a re-recording of a 1969 album called The Simon Sisters Sing The Lobster Quadrille and Other Songs for Children. It was released in 1973. [Here's the Wikipedia entry]. As you can see from the track listing, the album consists of musical renditions of famous poems, including "The Owl and the Pussycat," another favorite of mine. While Lucy didn't have the pop music success that Carly enjoyed, she did become a successful composer on Broadway. In 1991, along with playwright Marsha Norman, she collaborated on the Broadway musical The Secret Garden, earning a Tony nod for Best Original Score. Her musical heart does seem to lie with literature. Fitting that she is the daughter of one of the founders of Simon & Schuster. Carly Simon has a page for this album on her website. You can find a used CD on Amazon, stream the album on Spotify, or purchase it to download on iTunes. Oh my goodness - Carly was a daughter of Simon and Schuster! And this sounds lovely, I'll be checking around for a second hand copy. Also -we are just back from France where we were camping and almost returned with a Darth Vader like yours. My third son turned nine while we were there and chose it as his present, but then changed his mind (thankfully - Vader would have needed his own seat and we really didn't have the space to bring him home!) I told him about yours though! Hooray for the Dark Side! :) He doesn't do anything but stand there, but we have great fun posing him. As much as I like Carly I can't believe I didn't know she has a sister. And she was Walter Cronkite's companion at the time of his death. My mom would love this! What an amazing find. It's lovely. Very folky, beautiful vocals.